Change is in the air at Woodinville’s EFESTĒ with former winemaker Brennon Leighton heading to Charles Smith Wines earlier this year (more on this in a future post) and Peter Devison, who was previously making wine at Precept Wine, taking over winemaking responsibilities starting with the 2012 vintage. If you aren’t familiar with Devison yet, you will be. Devison grew up in Halifax, Nova Scotia before moving to Vancouver to attend the University of British Columbia. It was in Vancouver that he first became interested in wine while working in restaurants. Wanting to be more knowledgeable about what he was serving, Devison started out – like many wine novices - reading Jancis Robinson’s Wine Course. Soon, he was devouring all of the books he could find. Devison went on to take WSET and ISG courses and work at a local retail shop. Inspired by his experiences, after graduating from UBC with a degree in kinesiology, he decided to attend Lincoln University in New Zealand where he studied enology and viticulture, ultimately graduating with a second bachelor’s degree. After working several harvests in New Zealand and Australia, life seemed to be pulling Devison far away from the Pacific Northwest. He even accepted a winemaking position in Portugal. Then, he learned that his sister was getting married and decided to head back to the Northwest for her wedding. He’s never left since. 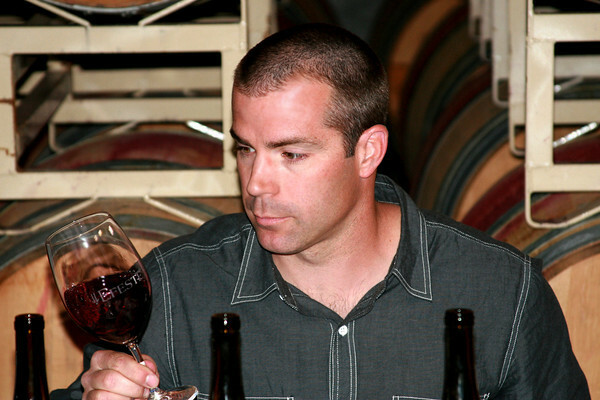 Devison began his work in the Washington wine industry in 2004, working a season at Vin du Lac in Lake Chelan as assistant winemaker. He subsequently moved over to nearby Tsillan Cellars, making the 2005 through 2007 vintage wines. It was in Chelan that Devison first met Brennon Leighton. Leighton, who was then at Chateau Ste. Michelle, was visiting with Ste. Michelle’s Kevin Corliss and Bob Bertheau to investigate the young growing area’s Riesling. From Chelan, Devison went on to work as an assistant at Waterbrook. After the winery’s purchase by Precept Wines, Devison went on to become responsible for all of the aromatic whites at Precept as well as the company’s Apex, Alder Ridge, and Willow Crest brands. When Leighton decided to take a position at Charles Smith Wines earlier this year, he contacted Devison about working at EFESTĒ. It was, as they say, an offer that he couldn’t refuse. The latest releases from EFESTĒ - all crafted by Leighton - show some new wrinkles, including the addition of a Boushey Vineyard designated Sauvignon Blanc and a French Creek Vineyard Chardonnay. These wines and the 2010 vintage red releases show the winery in top form and are among the more exciting wines I have sampled this year. There is a freshness and intensity to the red wines in particular that is nothing short of breathtaking. What will Devison do for an encore? Only time will tell. But having tasted through some of his Precept wines recently as well as barrel samples from the 2012 vintage, one thing is clear. EFESTĒ couldn’t be in more capable hands. Picture courtesy of EFESTĒ. Read previous posts on EFESTĒ here. (Excellent) An aromatically appealing wine with toast, lime, and mineral notes. The palate has abundant minerality and taught acidity with a fleshy feel and drawn out citrus flavors. 100% Sauvignon Blanc. Aged 8 months on lees in French oak (9% new). 12.45% alcohol. 465 cases produced. (Excellent/Exceptional) An aromatically restrained but appealing wine with abundant mineral notes and light spices. The palate is textured and drawn out with incredible richness in the mouthfeel and tart acidity. 100% Chardonnay. Aged 10 months in French oak (18% new). 13.4% alcohol. 409 cases produced. (Good/Excellent) Considerably riper in style than the winery’s Evergreen Vineyard Lola offering, this Yakima Valley Chardonnay is full of ripe fruit flavors and spice with a textured feel. 100% Chardonnay. Aged 10 months in French oak (25% new). 13.62% alcohol. 88 cases produced. (Excellent/Exceptional) An aromatic wine chock full of fresh raspberries and blackberries along with light herbal tones and black and green olive. The palate has an incredible sense of vibrancy and freshness, full of tart fruit flavors that draw out across the palate leading to a lingering finish. 100% Syrah. Boushey Vineyard (Factory Road Block). Aged 15 months in French oak (17% new). 14.92% alcohol. 571 cases produced. (Excellent/Exceptional) An aromatically brooding wine loaded with mineral notes, blueberry, thistle, cherry, and plum. The palate is breathtaking with incredible texture and density with a prolonged finish. An incredibly pretty wine that is simultaneously fleshy and graceful. 100% Syrah. Aged 15 months in French oak (31% new). 14.95% alcohol. 180 cases produced. (Exceptional) Dark and brooding at present with black cherries, dark plums, sea salt, floral notes, and mineral notes. The palate is big and bold, opulent with loads of cherry flavors and chalky tannins. Not a shy wine but delivers the goods. 100% Syrah. Ciel du Cheval (40%), Klipsun (35%), Ranch at the End of the Road (17%), and Angela’s vineyards. Aged 15 months in French oak (22% new). 556 cases produced. (Exceptional) An aromatic wine full of brambly fruit flavors, pepper, light meaty notes, floral notes, and crushed rock. The palate is weighty and textured showing incredible polish and grace. 75% Mourvèdre, 16% Syrah, and 13% Grenache. Aged 15 months in neutral French oak puncheons. 15.24% alcohol. 136 cases produced. Anyone know the real reason Brennon left EFESTE? No tasting notes on 2010 Big Papa or Final Final? I'm pretty excited to see what Leighton does with Chardonnay. Certainly not an easy task to bring the rain when it comes to that varietal in WA, but he and Charles Smith appear up to the task. That said, EFESTE has been a pretty solid choice for a number of years now, and it'll be interesting to see how this shift shows off the winemaker vs. winery essence. Good writeup, Sean. Hdchappy, I'll write more about what's next for Leighton in a future post but, in short, he got a great offer from Charles Smith to make some of their wines, start a high end Chardonnay project, and start his own small production winery. Who could say no? ibglowin, not released as of yet. I believe they come out in the spring. Tom Biro, thanks! I'm extremely excited to see what comes out of the Chardonnay project. I look forward to trying Devison's first releases at EFESTE as well. No one:) Thanks for the clarification Sean. I know that Brennon has a passion for whites and he would seem like a great fit with Charles Smith. I will look forward to your future write up on this.